Friday, May 18, 2018, 10 a.m. – 12 p.m. This training will include an introduction to more advanced terminology for the trans and gender non-conforming (GNC) communities. 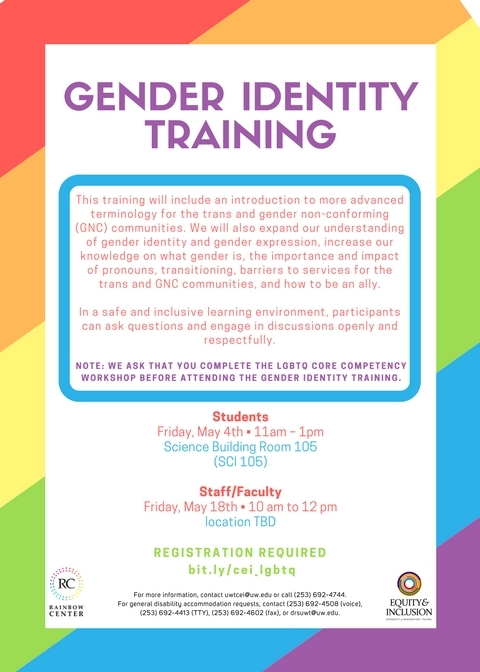 We will also expand our understanding of gender identity and gender expression, increase our knowledge on what gender is, the importance and impact of pronouns, transitioning, barriers to services for the trans and GNC communities, and how to be an ally. In a safe and inclusive learning environment, participants can ask questions and engage in discussions openly and respectfully. We ask that you complete the LGBTQ Core Competency Workshop before attending the Gender Identity Training.